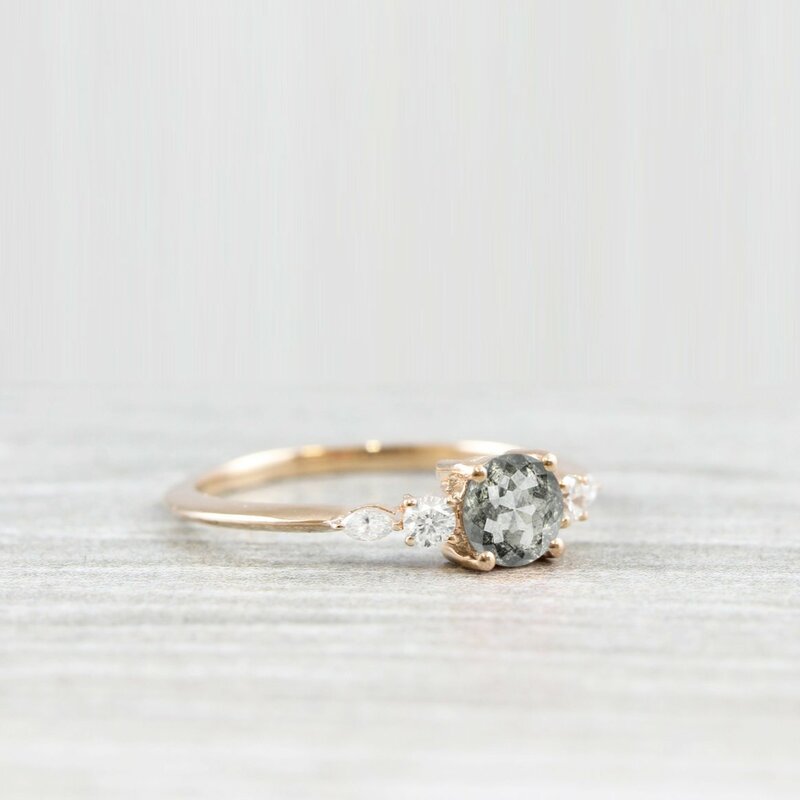 This brand new stunning ring features a central rose cut salt and pepper diamond, set with 4 marquise and round shape diamonds in a petite style mount! Wow this seller is so kind! :) The ring I got is BEAUTIFUL and even more gorgeous than the pictures!!!!! You gots ta buy from her!!!! She is very accomodating to questions and very generous! Daaaaa best!!!! Shipping was fast and in plenty of time before engagement. My fiancé loves it!! I asked specifically for the darkest salt and pepper diamond and Ashley delivered. Thank you!! We are both really happy. Ps. It came in an awesome wood grain box. Totally worth 5 stars! 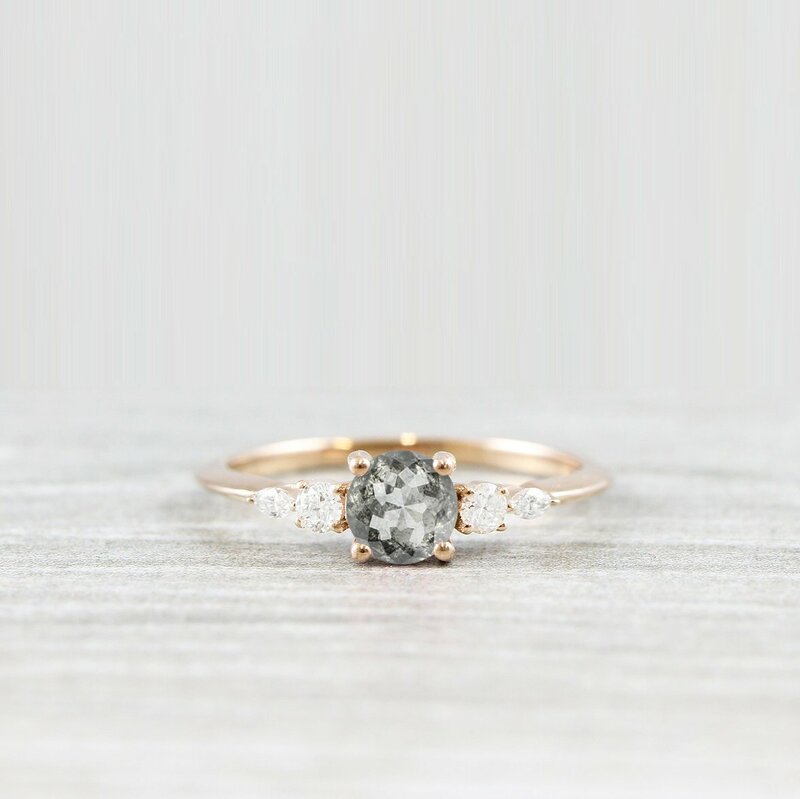 Not only is the ring beautiful, but the entire process, from the very beginning through delivery, was as smooth and simple as could be, thanks to Ashley. He promptly answered every single question I asked and was extremely helpful through the process, even before I officially decided to purchase. As you can see in my picture, the center stone is darker than the one that appears in the site's picture, so keep in mind to clarify or discuss the exact shade with Ashley if you want (I did not know to do this so I did not necessarily expect the center stone to be as dark as it was upon arrival, but thankfully my fiancée finds the ring absolutely perfect as is, as do I). I purchased expedited shipping to make sure it arrived on time, and even still it arrived MUCH sooner than promised! Thank you so much, Ashley! 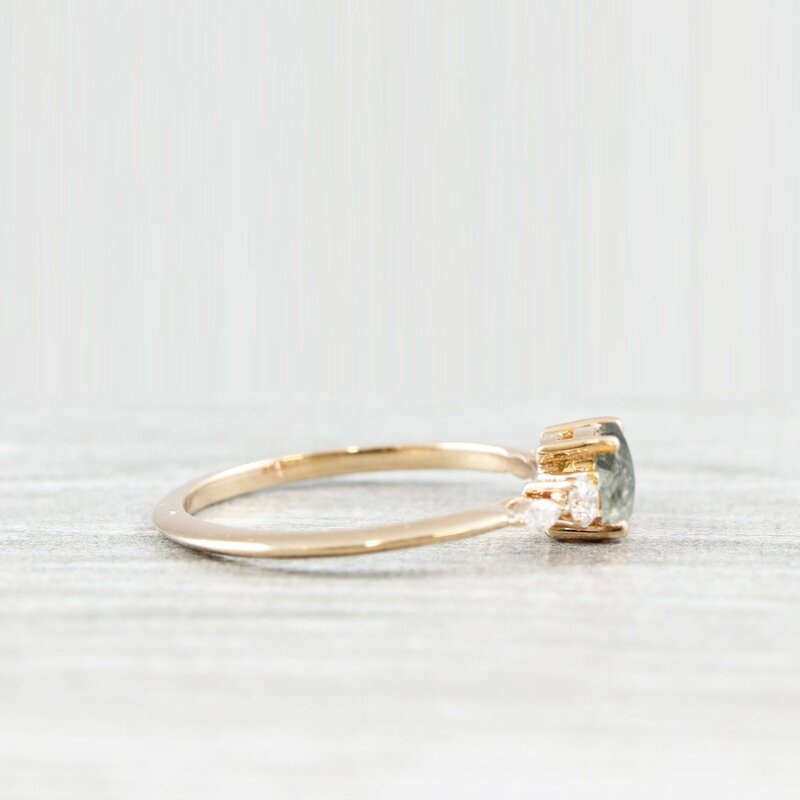 This is an amazing ring which I really look forward to wear every day. It looks fantastic, the fit and size is perfect. Production and shipping was really fast and I had the ring in my hand 3 weeks after I order it. We are very happy with this shop and highly recommend it! Fantastic service and a very happy and pleased fiancé. The ring is stunning and exactly what she wanted. Custer service was great and they helped massively with a shorter time scale than usually needed.